Psychedelic or "magic" mushrooms have been used for centuries in cultural ceremonies and sacred rituals by indigenous groups in Mexico, South America and other countries. After their discovery by the Western world, they became one of a number of natural and synthetic hallucinogens, abused for the striking distortions of reality they create. Psychedelic mushrooms contain the chemicals psilocybin and psilocin which cause hallucinations and alter perception and consciousness. The "mind-altering" effects of Mexican magic mushrooms became known to the Western world in the late 1950s. During the 1960s, they became popular as a recreational substance of abuse in the United States and Europe. The Mexican mushrooms that were being used in sacred and healing ceremonies were first classified in 1956 as Psilocybe mushrooms by French botanist, Roger Heim. Since then, many subspecies of the Psilocybes and other families of hallucinogenic mushrooms have been found worldwide, mostly in Mexico. 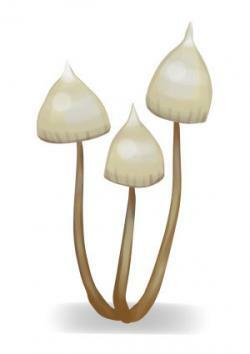 According to the U. S. Drug Enforcement Agency, fresh psilocybin mushrooms have white or whitish grey "long, slender stems topped by caps with dark gills on the underside." The surface of the caps are whitish with light or dark brown edges. The caps of the dried mushrooms turn brown with whitish spots. The mushrooms grow wild in tropical and sub-tropical climates, including parts of the U. S. Gathering them from the wild brings a risk of collecting poisonous varieties. They are easy to cultivate, which led to wide availability during the 1960s hippie drug culture. In 1958, Swiss chemist, Dr. Albert Hoffman, identified and extracted psilocybin and minor component, psilocin as the hallucinogen chemicals in the Mexican Psilocybe mushrooms. He was also able to make synthetic psilocybin and psilocin. When ingested, psilocybin converts to its metabolite, psilocin, felt to be the active cause of the hallucinogenic effects. Hoffman had previously created the synthetic hallucinogen, LSD in 1938. 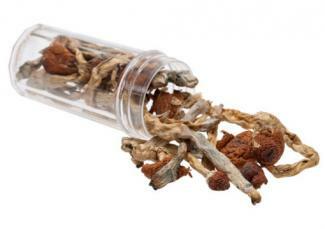 Psilocybin and psilocin are alkaloids, chemically related to LSD and produce similar effects. They are also structurally related to the neurotransmitter serotonin and may cause their effects by interfering with serotonin signaling between nerve cells. There is evidence that these "sacred" mushrooms were used by indigenous people of Mexico and other parts of Central America centuries before the Spanish colonization, and in other cultures in prehistoric times. In traditional use, the bitter mushrooms are eaten fresh or dried, added to foods, soaked in water, or brewed as tea and drank. Mexican natives used these "divine mushrooms" (teonanacatl) or "fungus of the genius" or "god's flesh" to invoke spiritual, mystical visions (entheogens) and for healing. Spanish conquerors considered the use of the mushrooms to be idolatry and forbade their use though the natives continued to use them in secret. The use of sacred mushrooms remained hidden from the Western world until 1939 when American anthropologist, Jean Bassett Johnson, witnessed a religious ceremony in Mexico. Then in 1955, American millionaire, Robert Gordon Wasson and his wife became the first Westerners known to ingest the mushrooms in a ritual in Mexico. The Wassons had made repeated treks to Mexico from 1953 "in search of the 'magic' mushrooms", which they detailed in Life magazine articles in 1957. Wasson and Roger Heim, the French botanist, collected the mushrooms in Mexico and cultivated and supplied them to labs for chemical analysis. These men and others, such as Timothy Leary, helped spread the use of psychedelic mushrooms and other hallucinogens in Western culture in the 1960s and encourage the march of the hippie movement in the U.S.
"Magic" mushrooms continue in use in traditional ceremonies in Mexico and other indigenous groups but are only allowed for certain religious use in the U. S. Also known as 'shrooms, caps, silly cybin, silly simon, boomers, musk and other names, psychedelic mushrooms are now illegal for recreational use in the U. S. and most other countries. Though illegal, people continue to experiment with the mushrooms. A survey of college students published in Drug and Alcohol Dependence in 2013 showed that 29.5% of them reported using hallucinogenic mushrooms out of curiosity and for the psychedelic effects. As described in the writings of Hoffman, the Wassons, Leary and others, the effects of psychedelic mushrooms or its chemicals start quickly and last from four to six hours. According to a National Institute on Drug Abuse fact sheet, like other hallucinogens, such as LSD and mescaline (peyote), psilocybin in magic mushrooms create a world of sensory distortions and psychological and physical effects. Crossed senses (synesthesia) such that colors are "heard" and sounds are "seen"
A user who is in a negative frame of mind before taking mushrooms or psilocybin can have a "bad trip." Negative effects, such as fear, panic and psychoses, are more common with larger doses. A positive frame of mind, as well as familiar people and setting, are more likely to lead to a positive, mystical experience. If the mushrooms or psilocybin are used often in quick succession, the user experiences less intense effects with each use. Psychedelic mushrooms appear to have little risk for psychological or physical dependence. In an analysis of 20 substances reported in the journal Lancet in 2011, mushrooms had the lowest risk of abuse and harm, alcohol and heroin having the highest risk. 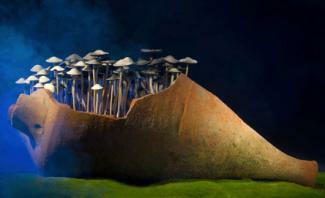 Still, hallucinogenic mushrooms have the potential to be abused for the experience of their psychedelic effects. Users who seek higher and higher amounts of mushrooms or psilocybin may benefit from behavioral therapy to decrease the chance of seeking more risky addictive drugs. After his discovery, Albert Hoffman made psilocybin available for psychiatry research in the early 1960s. However, because of federal restrictions on recreational use of mushrooms and other hallucinogens, psilocybin research stopped in the United States in about 1968, as well as in other countries. In study published in 2006 in Psychopharmacology, participants reported "mystical experiences" and positive effects which persisted at follow-up two months later. A 2011 study reported in the same journal found that study subjects had similar positive experience and rated them as having "substantial personal and spiritual significance" up to 14 months after the study was over. Of note, about 30% of the participants reported experiencing negative effects such as anxiety, fear, and paranoia during the studies, which were managed with reassurance by the study monitors. Though psychedelic mushrooms can cause negative disturbances, they have been used for centuries for healing, as well as their spiritual and mystical effects. Exploiting the positive effects on mood and the spiritual experience may prove useful for a number of physical and psychological conditions. When the mushrooms are ingested, however, it is impossible to control the dose of psilocybin to optimize the positive benefits. However, with further research, it may be possible to figure out the the correct therapeutic doses of the extracted or synthetic psilocybin to assure maximum benefit and safety in the appropriate setting.